Veronica Cross, still from See/Me, 2018, single channel color video with sound. Nikki Juen, still from Cyborg Matr [b. 2013], 2016, video installation, dimensions variable; duration 14 minutes. NEW ORLEANS, LA: The UNO St. Claude Gallery is pleased to announce the opening of Embodiments, a two-person exhibition featuring works by artists Veronica Cross and Nikki Juen. The gallery will present a selection of Cross’s paintings and videos and Juen’s videos, featuring her performance-based collaborative work in Brick X Brick. Both Juen and Cross use the body as material and cerebral content, particularly as it enacts femme gender. Juen’s Cyborg Matr (b. 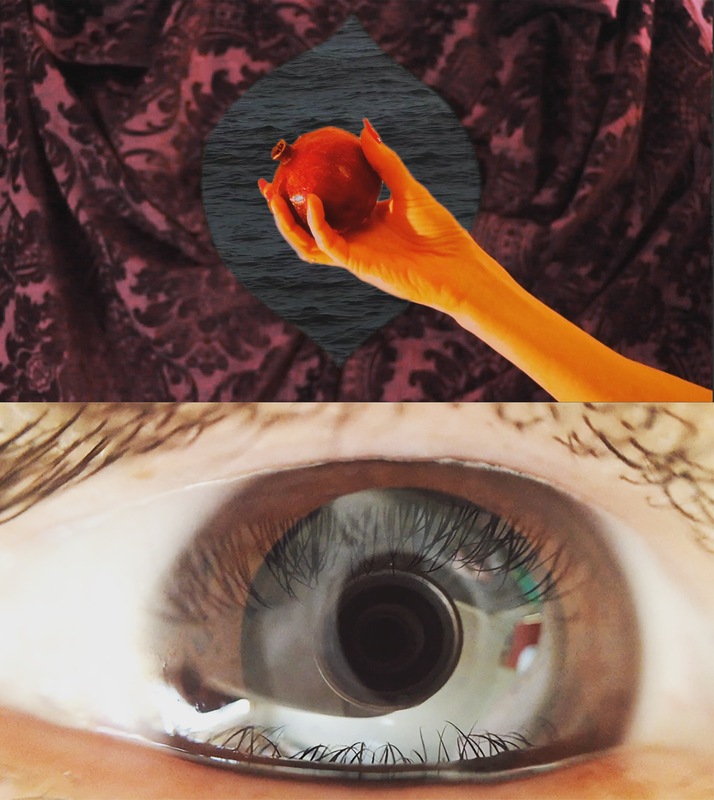 2013), 2016 and Cross’s See/Me, 2018 offer the motif of the eye as portal; the artists consistently employ their own bodies in their videos to explore roles of receiver, conduit, alloy, ally, messenger, and icon. In both her videos and paintings, Cross uses objects and animals as hyper-theatrical surrogates for the body and its performative references. This visual lexicon includes feathers, an old car door, a horse, and a pomegranate. This femme-body morphs between states of trauma, healing, joy, and communion through strategies of riffing on and internalizing (disidentifying) traditional and popular tropes of representation of femaleness and disempowerment. In her paintings, objects and their associations are conjured and secured like scars, as the imagery is created by scratching into the painting’s surface. For Brick x Brick, Juen’s project with her collective Public Displays of Affection (PDA), participants hold hands to create silent walls while wearing jumpsuits screen-printed with bricks and slurs. The slurs—a sampling of misogynistic rhetoric touted by Donald Trump—printed across live bodies highlights the violence of the words and signals the determination of the participants to have control over their own bodies. Here, words on the body unify and (re)claim, looking toward a solution of healing. Juen’s other videos in this exhibition strive to capture the experiences of being alive, starting from a pre-cognitive location. Her descriptions of myriad experiences such as temporary blindness, media bombardment, and mediation signal pathways toward better living, an initiative aligned with her role as an educator. The exhibition will be on view until April 8. Nikki Juen is an artist, designer and educator interested in the spaces where these practices overlap. She is a lecturer and critic in the Division of Experimental and Foundation Studies at Rhode Island School of Design. As a founding faculty member of the MFA in Graphic Design at Vermont College of Fine Arts her research focuses on the body as media as well as the contemplative mind in higher education. Her classes, workshops and mentorships explore the development of the individual through the cultural roles of art and design in society. She helps non-profits, institutions, and individuals develop attentive and holistic understanding of their intention, function, and efficacy. Juen recently spoke in Chicago on International Women’s Day as part of the American Institute of Graphic Arts initiative, Women in Design: Leading with Intent and Integrity. As a poli-disciplinary practitioner, Juen explore’s the actions of making of art and design while using education as agency in a search to represent the ways humans share a collective social body. Through gestures of receiving and giving, she seeks participatory engagement as an aesthetic form that considers the viewers implication in layers of public feelings. As a poli-disciplinary practitioner, I explore the actions of making of art, design and education as agency in a search to represent the ways humans share a collective social body. Through gestures of receiving and giving, I seek participatory engagement as an aesthetic form that considers the viewers implication in layers of public feelings. With a focus on the body as media as well as the contemplative mind in higher education, my work attempts to understand how the body is media for light and dark and how to make this understanding functional. In other words, how can we understand the experiences of a porous social body as an opportunity to live well. And since we don’t all live well, or have experiences in wellness, can healing occur in situations and places that do nothing to support a wholeness of individual human experience.